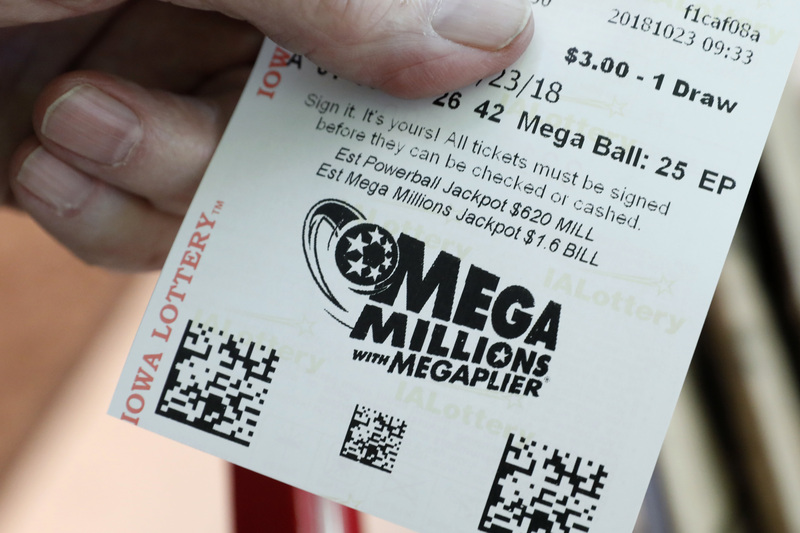 A customer shows his Mega Millions lottery ticket at a local grocery store, Tuesday, Oct. 23, 2018, in Des Moines, Iowa. Lottery players will have a chance at winning an estimated $1.6 billion jackpot in Tuesday night's Mega Millions drawing. The Mega Millions Jackpot is a Mega Billion today. New Yorkers are all vying for their chance to win the $1.6 billion pot. At a Bronx 7/11, Rachel Stevens noted that the line at the cashier is longer than usual. "Last week it was a lot, and then today it's much more," said Stevens. "A lot of people are buying a lot, alotta tickets." To put $1.6 billion in perspective... with that amount of money, one could buy about 582 million metro swipes, 320 million Sunday editions of the New York Times, or rent a studio apartment in Manhattan for 45,000 years. But, people aren't necessarily planning on buying boats or sports cars, most lottery hopefuls I spoke with expressed a desire to take care of their family and loved ones. If one were to end up winning the biggest Mega Millions Prize ever, they'll have a lot less than the $1.6 billion to share the wealth, that's because in New York lottery winners are saddled with the highest state withholding tax in the nation - 8.82%. In addition to that, if you live in New York City, there's an additional withholding tax of 3.876%, leaving winners with prizes closer to $600 million. Still, becoming a millionnaire overnight, would still be quite the windfall, for the average New Yorker. According to Payscale, the average salary in New York City is $68,960, with some people in neighborhoods like Brooklyn, Harlem, and the Bronx living on less than $20,000 a year. While there's a one-in-303,000,000 chance of hitting the jackpot, if the lucky winner lives in one of the 5 boroughs of New York City, there will be an influx of $115 million to the city.